It's been a while since I've posted here, mostly down to life getting busy, meaning I just haven't had time to collect my thoughts enough to write. 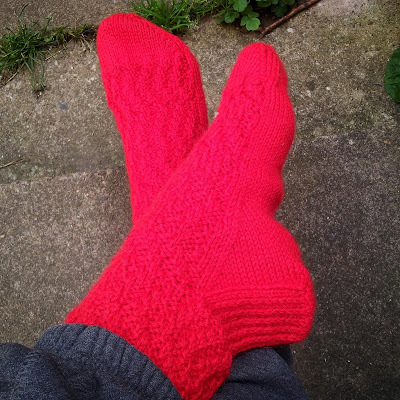 It was only when I popped onto Ravelry to update a project that I realised how lax I've been. Ooops! 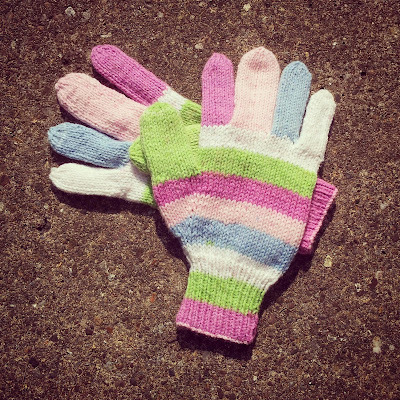 I went on a glove knitting drive towards the end of the summer, preparing for winter. I started off with gloves for M, adding to her dwindling supply of pairs that fit with ones that don't fit because they're a bit on the big side. I am currently embracing the she'll grow into it theme when making things for M! 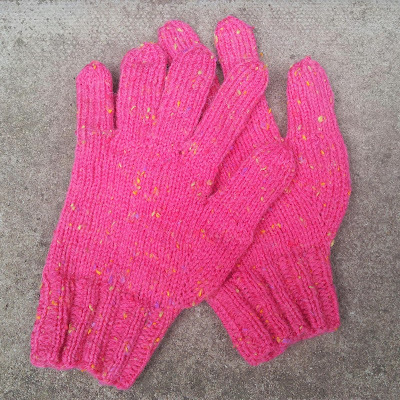 I'd never made gloves before, so this was a steep learning curve which is why I started with a practice pair, intended for no one in particular. 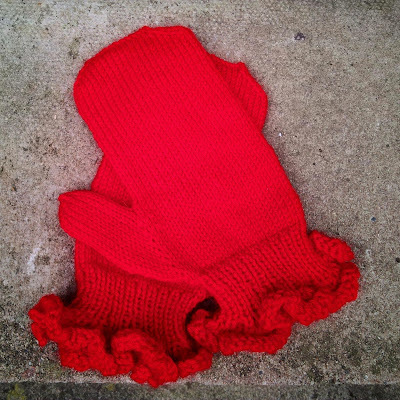 I picked up a book called Gloves by Sussette Palmer, working through the pattern for 'Childs Play' gloves and treating it as a tutorial (link to my Ravelry project) . As these were for 'playing' purposes, I didn't worry about gauge or fit, concentrating instead on the process of what it was I was trying to achieve, namely learning how to knit fingered gloves. The result is OK, all things considered, but they won't fit anyone in this house, so I may end up passing them on. The tricky bit with gloves has got to be the fingers, knitting such small tubes and keeping the tension even was difficult. I don't think I got it right and I had issues with ladders between DPNs, something that mystified me because I don't recall having problems the last time I worked in the round. 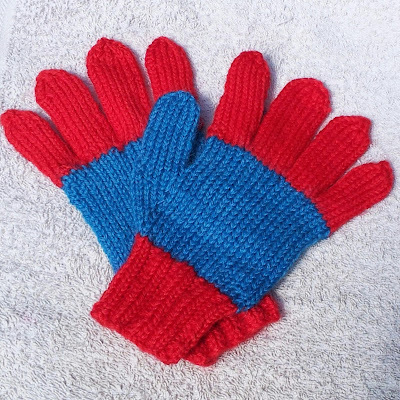 It took me until the ninth finger to find my groove, so I tried again this time with a pair of gloves for M.
These were made exactly to M's specifications, but I upped the sizing a little so they should fit for a year or two. M loved them. I like them, but wasn't completely satisfied with the thumb. Tricky things, thumbs. My Ravelry project for these is here. 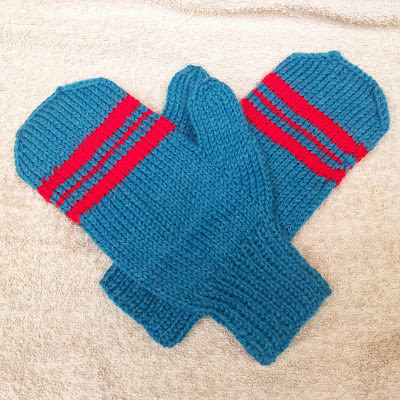 Not to be deterred, I also made M a pair of mittens (here on Ravelry). The mittens were made using the Pretty In Pink pattern from the Gloves book and there were a couple of errors in the pattern. i.e. When working the last row of the frill (R5), the pattern says ”k2tog to the end”. R1 starts on the wrong side, so R5 needs to be purled, hence the instructions should read ”p2tog to the end”. These definitely are too big. An (albeit small) adult visitor tried them on and declared they fit her, which gives an idea of how big they are, but I like them and they'll fit ok in a year or two. M liked these ones and the fit is better. Still on the large side, but more wearable I think. Lesson learned here - I really do need to work on how big, is too big and how big is just a bit of growing room for small people. 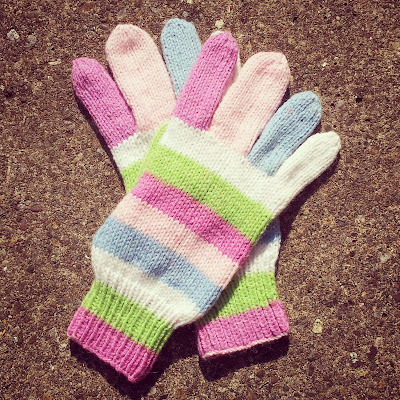 Next, I used some left over yarn to make a pair of gloves for me (Ravelry link). This time, I worked without a pattern and I sized exactly for me. I have long fingers and shop bought ladies gloves are usually too small, so this is the first pair of gloves I've owned that actually fit. I tackled my dislike of the thumb in this pair, offsetting its gusset by 3 stitches, meaning I have a left and right glove. M said she liked these too, but I insisted they are for Me. Hopefully, they'll see some good use this winter. Next up, I tackled socks (here). 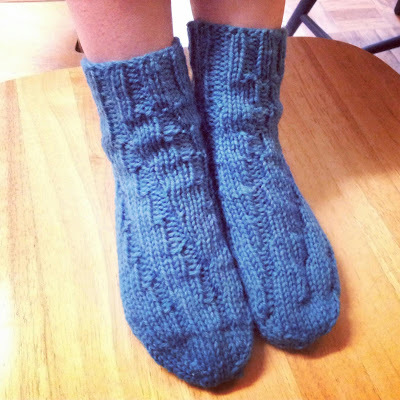 It has been a long, long time, so I made a pair of bed socks/slippers for me. Again, no pattern just me trying to remember what to do and while I'm OK with how these turned out, they are too big. Where there was some rounding up needed for pattern purposes, I went up rather than down which means the sock is much looser on than I'm happy with. They're OK for bed socks, but if I'd intended these for regular wear I'd have been disappointed. A bit big, but fit for purpose. Next I went on a hat making binge, making up three nearly identical hats except for the striping pattern. 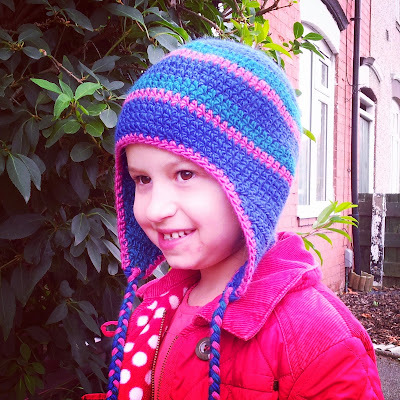 The first hat was for M (Ravelry link), with the young lady herself choosing the colours and yarn. She also helped me with the striping pattern. I used a 100% wool Sublime Yarns Natural Aran and while it might have purported to be aran weight, it wasn't consistently so. Deliciously soft it might have been, but the yarn went from fat to thin and in some places becoming very skinny indeed, which meant I couldn't hit gauge for the pattern I used (which was Lindsey Carr's Seamless Earflap Hat). M's new hat for winter. In the end I picked a hook that worked (5mm), swatched to work out the tension and subsequent gauge, then recalculated everything accordingly. All of which means, I mostly used the pattern to get the proportions right. M loves this hat, even if again, it is too big for her. She'll grow into it, right? 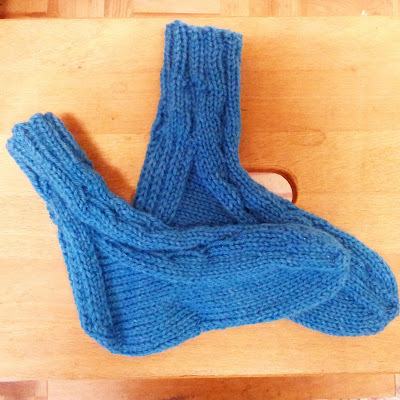 Finally, we have Blue Bed Socks for M (Ravelry link here). 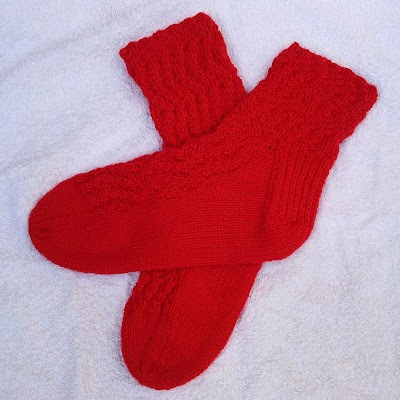 And finally, bed socks for M.
Again, this is my own pattern and are hot off the needles this weekend. I used 4mm DPNs and stash yarn, using a simple 4x2 rib and shifting it either left or right every seventh row. The result was effective and M approves, although she has yet to put them to the test. And that about brings us up to date, with the knitting at least!